Kilimanjaro has 7 main routes to the summit. Some join up along the way and some follow varying trails depending on the number of climbing days and campsites used. 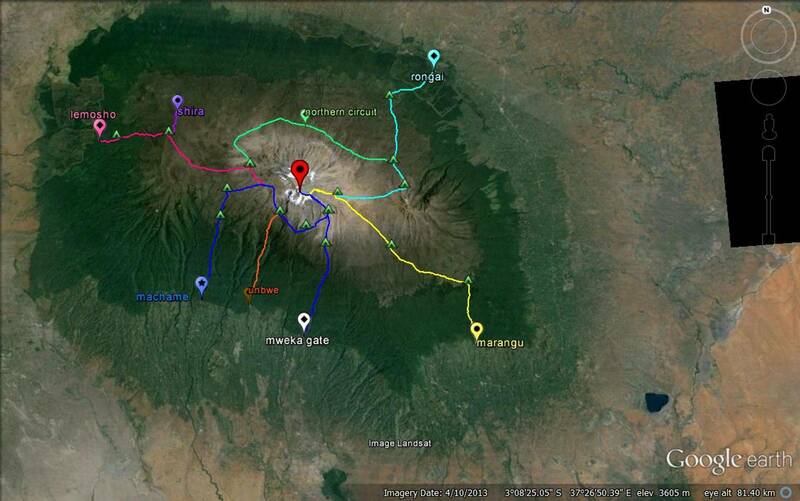 The main routes can be grouped according to the direction of approach and point of ascending to the crater rim. Lemosho is becoming more popular these days, but it’s still significantly quieter than the Marangu and Machame trails. You’ll see much more of the mountain as you cross from the western slopes and across the Shira plateau before joining the Machame route. The summit is accessed via Stella point. Descent is through Mweka gate. A longer route with excellent acclimatisation and high rates of success. The trailhead is at 3,400m a.s.l. on the Shira plateau. It’s rarely used due the very high starting altitude. The Lemosho route is a far better version of this old route with its lower starting height and glorious forest and heathland scenery on your first 2 days trekking. We don’t offer this route. The most popular climbing route these days. Starting on the south western slopes the trail skirts the base of the summit. You reach the top of the crater rim at Stella point then descend through the south eastern Mweka trail. Machame has great scenery and good ascent profiles aiding acclimatisation. It’s often completed over 6 days, a tough climb with some long days trekking. 7 days on this route allows more acclimatisation and rest before summiting. Umbwe route is rarely used. Its the shortest and steepest route to the summit taking just 3 days to reach Uhuru. traditionally using the Western breach for summit access. Suitable for experienced and strong climbers, we now only offer this route via Stella point. Descent is through the Mweka trail. The original route to Uhuru peak. This route starts at the south east not far from Marangu village. You’ll ascend gradually upwards passing near Mawenzi peak. Then make your summit bid via Gilman’s point. Your descent is returning more or less by the exact same trail. This route has hut accommodation only and can be busy as the ascent and descent are along the same route. A Rongai trek starts the ascent on the north eastern slopes. The routes follows the eastern trails to the south and joins the Marangu route on the trek from Mawenzi tarn. The summit attempt starts at Kibo huts and reaches the crater rim at Gilman’s point, to the east of Stella point. Your descent is down the Marangu route. The Northern route is a longer trek starting on the north east of Kilimanjaro. Unlike the other routes you'll trek across the northern slopes of Kibo and eventually joing the Lemosho and later the Machame trails. The route summits via Stella point and descends through Mweka. 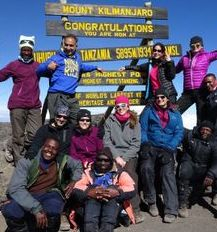 This trail can be done over 9 or 10 days, gives unparalleled acclimatisation and an almost complete circuit of Kilimanjaro. It's only for those who love camping out with such a long time spent 'roughing it' on the mountain. Which route is for you ? You might read or hear that some routes are harder or easier than others. In reality there are NO easy routes to the summit. They all lead in the end to the base of Kibo - that's the snow/ice covered bulk that forms the summit massif. Then you have to climb that. Of course, your budget and time available will have a significant influence on your choice of route and you may prefer staying in the huts rather than camping in a tent but here are a few things to consider. The promise of hut accommodation can make the Marangu route very attractive if you’re not a keen camper. They are actually not bad, particularly the newer ones. However, they are all dormitory style, you’re likely to be sharing with other climbers. So it can be noisy with squeaky floors and closing doors especially when the regular night time toilet visits kick in at higher altitudes. Then, of course, there's the snorer risk factor to take into account too. Camping will give you more privacy. You won’t be putting them up or down so no work to do and you’ll have a communal mess tent to suit the size of your group for afternoon and evening get-togethers. Your sleeping tents are mountain grade so you won’t be able to stand up in them and, if you’re unlucky and have heavy, prolonged rain, wet gear hanging space is limited. You’ll have a 3 man tent for 2 people but you can have your own personal tent for a small supplement. You may have seen climb routes offered that aim to reach Uhuru and return in as little as 5 days/4 nights on the mountain. Unless you already have some level of acclimatisation it’s not recommended to attempt the climb in such a short time. Your chances of success lower significantly with fewer days of ascent. If you are not used to camping and 'roughing it' then the longer climbs may not be your best bet. 6 or better still 7 days should strike a happy medium between getting enough acclimatisation and not wearing down through the deprivations of camping out. The simple rule of summiting Kilimanjaro – the longer and the slower your ascent, the higher the chance of success. If you’re determined to reach the top then its far better to spend a few hundred dollars more on your climb now than to have to spend a few thousand dollars doing the whole climb again. Also a longer climb gives you more time to actually enjoy the mountain and take in your surroundings. It would be such a shame to not have time to see and appreciate Kili’s beauty. It’s generally thought that taking trails that go up and down a lot during the treks aids your acclimatisation particularly when you walk higher during the day than your overnight sleeping altitude. The western approach routes (Lemosho, Machame) have ascent profiles with greater altitude gains and losses on most days. Rongai has a less dramatic level of altitude gain and loss on the treks. Marangu route follows a much more gradual, linear ascent, which is why it’s often said by some to be ‘easier’. In fact, it’s likely that it makes your climb harder, especially for your summit attempt. Stella point or Gilman’s Point ? The Marangu and Rongai routes both arrive at the crater rim (top of the mountain but not the highest point) at Gilman’s point. 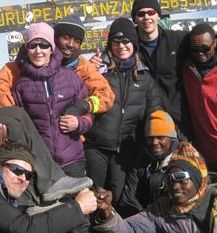 From there it’s about 1.5 hours to walk to Uhuru peak the true summit of Kilimanjaro. All the other routes reach the crater rim at Stella point. Then there is about 45 minutes walking to Uhuru peak. You’ll see more of the crater arriving at Gilman’s but you’ll have longer at very high altitudes which can be very debilitating. There is a third route to Uhuru via the Western Breach. We do not offer this route due to several fatal rock falls over the last 10 years. We won't risk your safety or the safety of our crew. Mountain weather is always unpredictable. On Kilimanjaro the typical weather patterns bring more rain to the southern and south eastern slopes of Kilimanjaro. The western and northern sides tend to be drier – which is reflected in the thickness of the forest belt. If you plan to climb during or close to the rainy seasons (April/May and Nov /mid Dec) then Rongai or Lemosho should be somewhat drier. You might have come across summit success rates for each of the routes. If not, Marangu has the lowest at around 45% and the average for Machame is around 70%. Differences are due to the ascent profiles and typical number of days spent on the climb. Your best choice based on success rate is taking an 8 day route which brings in successful Uhuru summit rates at a huge 95%.